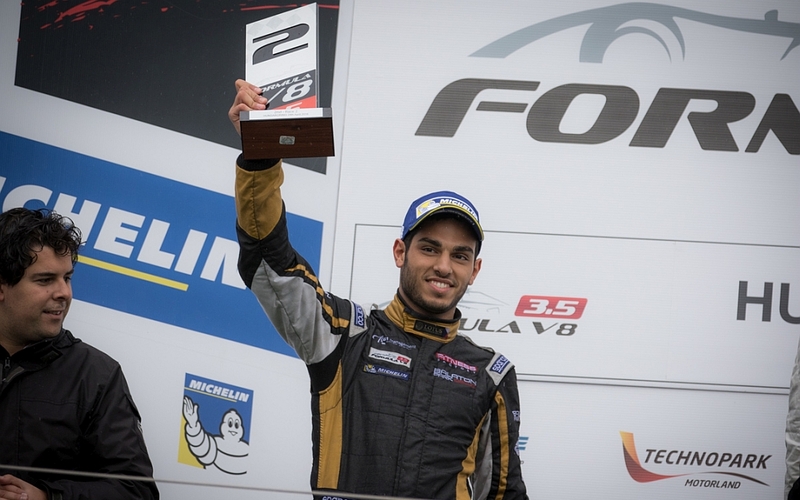 Lotus team ended the Hungarian round of the Formula V8 3.5 series in-style today in Budapest with a great second place captured by Roy Nissany in race two under heavy rain. The Israeli driver took a front row spot in wet conditions at the end of qualifying 2, confirming his strong form in the afternoon. After the start was given behind the safety-car, Nissany spun at the last corner before rebounding to complete a fantastic recovery up to P2. In the very last laps, Roy closed the gap from the lead trying to get a win in a really special place. Budapest is a bit of a second home for him and it was great to see the local crowd cheering in front of the podium. Lotus gained more points thanks to Rene Binder, who finished in P7 despite a spin on lap 5. The Austrian was also unlucky as he had to complete the mandatory pit-stop after the second neutralization, but delivered a good recovery in the last part of the race. “It was a strange race. Obviously this is a great place for me to take the first podium of the season. Good thing it happens at the beginning of the year. It was a tough race, I felt my grip and my speed constantly improving and improving. By the time I reached Tom it was too late but I tried to overtake him anyway. He’s a good defender and made my life hard, especially in these conditions. I’m happy to be here but next time I wanna sit in the middle as a winner”.